It’ll take more than a few compression issues to take the shine off of this JRPG classic. A soundtrack so good we load the game just to listen to it. Loses some of its impressiveness on the smaller screen. Bottom screen menus would be easier with touch controls. There is a moment about three hours into Xenoblade that ranks among our videogame favourites. Two young pals, brought up in the confines of a cosy colony, seek to avenge the death of a close friend. Their world resides on the corpse of a massive slain titan, so the journey takes them from a safe nook behind its knee, through subterranean cartilage, to the giant’s thighs. As you step onto the rolling plain percussion begins to thump out a glorious uplifting tune, while the camera pans out to reveal herds of fantastical creatures roaming a field that stretches into the horizon. Finally free of those tangled caves, it throbs with the spirit of epic adventure. And it gives us chills just thinking about it. Xenoblade is all about moments of scale, as each new area reveals how nature has reclaimed the giant’s body. An elbow becomes a knobbly mountain, its exposed back sprouts a lush forest. There’s even a sweaty swamp in the folds around the crotch. As such it’s a game that made perfect sense on the Wii, where a massive TV screen saw the heroes dwarfed by their surroundings. Shrunk down onto a five inch 3DS display and those surroundings are dwarfed by your own titanic hands clutching at either side. It’s not an obvious choice of game to port, especially when it’s designed to sell the New 3DS model – it won’t run on the original handheld. Or perhaps that’s the point: this could be an act of technological willy-waving intended to show what the improved CPU can manage. If so, consider us impressed. The game’s a neat approximation of its console big brother, maintaining that mega scale by sacrificing micro elements. Textures are muddier and smaller creatures fade into view as you approach them, but never to the point that it loses the feel of a busy ecosystem. If its tininess means detail is lost when the camera is at a usable distance, zooming back in reveals customisable costumes and your robot enemy’s clanking gears are present and correct. Cutscenes, all in-engine, hold up particularly well. What's new on New 3DS? Aside from the obvious 3D, the only major addition are models and music tracks unlocked using 3DS functions. Save up Play Coins, StreetPass a fellow player, or touch a Shulk amiibo to the console and you’ll earn tokens for the raffle. Good luck with that last one – we can’t find the toy anywhere. Just racks of unwanted Princess Peach. Yet all this does make combat harder to decipher. The command bar takes up more of the screen and zooming out to better frame the action makes it hard to judge enemy positions – a key tactical point, as some attacks do extra damage from the side or behind. Larger boss creatures are prone to serious frame rate drops when all three party members start launching special attacks that better resemble firework displays. It generally makes for rougher battles compared to the Wii version, but it’s manageable. Much is fixed by having the camera sit closer to the action, though this does require you to adjust it more often to keep darting enemies in the frame – easy enough, due to the New 3DS’s analogue nubbin. And it’s a battle system worth staying for. Taking inspiration from Final Fantasy XII – you pick fights at will with free-roaming creatures – you control a single hero, balancing auto-attacks with special Arts. Some Arts need correct positioning to work, others combine with your chums’ for added damage – keeping an eye on the flow of a fight and Art cool-down times creates thrilling, urgent scraps. Hits also charge up team chain attacks which grant brief command of all party members to queue up specific moves. As affections deepens between your team these chains grow ever longer. Running circles around a snarling robot fiend using only the power of friendship is pretty rad (though it’d end in nothing but tears in the office…). On this rock-solid foundation, Monolith build all kinds of cleverness. Like a mystical soothsaying sword that alerts you to incoming fatalities and gives you ten panicked seconds to alter your grisly fate. Or the ability to change your party leader at will, giving you a whole new set of Arts to master. Then there’s the substrata of minor bugbears that have been wiped out: the party auto-heals at the end of every battle, there are no potions or items to manage and, most importantly, death merely boots you back to the nearest landmark, all character progress intact. As so many JRPGs struggle to find their place in the 21st century, Xenoblade delivers one of the most confident visions in years. It’s as if Monolith created a giant list of everything you hate about JRPGs and banned it outright. You can save anywhere, anytime. You can warp to any landmark, instantly – the impressive loading-free jumps of Wii are intact on 3DS. You can pick your fights and run away from any battle. You don’t have to return to a quest giver for a reward, as it’s gifted to you the second the task is complete. Even better, your Mystic Meg-like sword will warn you if a random object will be used in a future side-quest, so you don’t accidentally bin it. That sound you hear is the Final Fantasy XV team desperately rifling through Monolith’s bins. And if they’re not, they should be. The idea of society growing on the body of deceased giant is pretty silly, but makes for a world like no other. Colony 9 here is your idyllic hometown. Well, idyllic until a load of robots turn up and stab your girlfriend. Reach the giant’s thighs and you’ll find majestic plains to paint red with the blood of innocent animals. Hooray! Makna Forest is basically the game’s own Forest of Endor, complete with highly irritating comedy creatures. The Valak Mountains grew from the titan’s arm. Those snowy biceps look like a perfect tobogganing spot. Just when you think you’ve grasped its scale it throws in an ocean laden with islands and aerial walkways. And all this is just the nuts and bolts that enable an adventure rich in character, epic in scale, and set on one of the most imaginative worlds ever built. The Monado-wielding Shulk may not have the iconic style of an FF protagonist – though he, and his friends, can be stripped down to their swimwear for a laugh – but he has a lot of heart, not to mention a plummy British accent. We’re not as sold on the cockney robot villains or the dreaded “It’s Reyn time!” soundbite spouted by Shulk’s lumbering companion, but it’s something everyone has to live with, as the Wii’s alternative Japanese voice track does not make the 3DS cut. We’re afraid it’s Reyn time, all the time. Dock a few points if you wish. As is probably clear, Xenoblade is a game we have real affection for, not to mention an 80 hour save file still sitting on Wii. And that’s 80 hours without finishing hundreds of quests and with most of a destroyed colony still in need of rebuilding. In this light, the concept of having a tiny Xenoblade in our pocket to chip away at is enticing enough to outweigh the flaws. 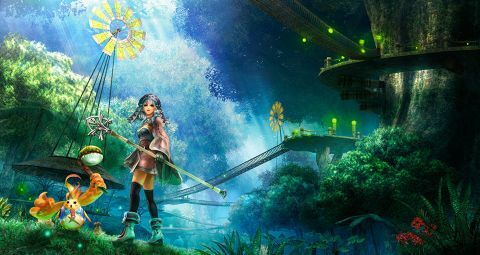 It may not be the best version of Xenoblade, but it’s a version of it – and that makes it a whole lot better than most. Description Relive the excitement of xenoblade chronicles on the 3DS.